It is the proud symbol of the nation's prosperity and good fortune. Just like Christmas and Easter, Thanksgiving has one major pagan symbol, the cornucopia. But unlike the Christmas tree or the Easter bunny, the cornucopia is linked directly to both Greek and Roman pagan Gods. There is a plethora of evidence that supports the fact that the cornucopia was in frequent use and display during Christ's time on earth, and it's unlikely that the cornucopia would have mistaken for anything but a pagan symbol. Cornucopia, Latin for "horn of plenty," in Greek mythology, one of the horns of the goat Amaltheia, which was caused by Zeus to refill itself indefinitely with food and drink. In paintings the cornucopia is depicted as a horn-shaped container spilling over with fruit and flowers. Many of the images commonly associated with Thanksgiving are derived from much older traditions of celebrating the autumn harvest. For example, the cornucopia (a horn-shaped basket overflowing with fruits and vegetables) is a typical emblem of Thanksgiving abundance that dates to ancient harvest festivals. Many communities also decorate their churches with fruits, flowers, and vegetables at Thanksgiving, much as European communities have for centuries during the autumn harvest season. The Cornucopia (Latin, 'horn of plenty'), a spiraling, woven basket overflowing with an abundance of produce, is an ever-present symbol of harvest prosperity. The symbol dates back to an ancient tale of the Nymph Amalthea,* who, as a reward from the infant Zeus for a meal of Goat's milk, was given an enchanted goat's horn which gave whatever one wished for. The cornucopia became a ubiquitous symbol of fotune and plenty, and was associated with many Goddesses, including Fortuna, the goddess of good fortune, and Ceres, Goddess of agriculture. *Sometimes, Amalthea herself is the goat. The cornucopia (Latin: Cornu Copiae) is a symbol of food and abundance dating back to the 5th Century BC, also referred to as Horn of Plenty, Horn of Amalthea, and harvest cone. In Greek mythology, Amalthea raised Zeus on the milk of a goat. In return Zeus gave Amalthea the goat's horn. It had the power to give to the person in possession of it whatever he or she wished for. This gave rise to the legend of the cornucopia. 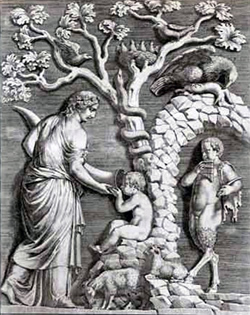 The original depictions were of the goat's horn filled with fruits and flowers: deities, especially Fortuna, would be depicted with the horn of plenty. In modern depiction, the cornucopia is typically a hollow, horn-shaped wicker basket typically filled with various kinds of festive fruit and vegetables. 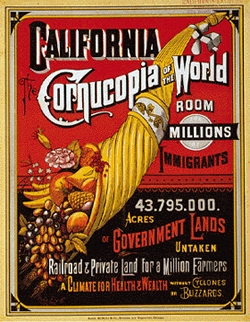 In North America, the cornucopia has come to be associated with Thanksgiving and the harvest. The cornucopia was a common religious symbol associated with Greek and Roman culture and religion. This symbol is found all over the world, on modern and ancient currency, banks, sculptures, government buildings, business logos, government seals, flags and coat of arms. It's used almost universally as a symbol of prosperity, abundance and “plenty”. It's used in the names of towns, streets, titles of books and magazines, in fact “cornucopia” is often used as a adjective. It even crosses holidays and is a part of Christmas as well.The world's oldest central bank, the Swedish National Bank, uses the cornucopia as the most prominent element of it's logo. There's a 30 foot tall statue of Hercules standing with a large cornucopia at the top of the city hall building in Dresdan, Germany. The cornucopia is found on the Royal Palace in Amsterdam, which is on the list as one of the “Eighth Wonders of the World”. It's on two of our state seals, Idaho and North Carolina. The exact reasons for the cornucopia to be attached to Thanksgiving day, at this point, is not fully understood. But there is plenty of evidence to suggest why it happened, as it's been a part of our society for a long time. 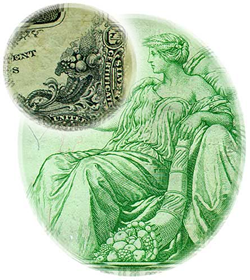 The Federal Reserve lists the cornucopia as a general symbol used in our money. A curved goat's horn overflowing with fruits and grains has been a popular element in the design of paper money. Called the cornucopia, this curious design element represents the horn of the Greek nymph Amalthea. Legend says that her magical container rewarded its possessor's every wish. Sometimes called the "horn of plenty," the cornucopia appears in the corners and on the edges of many of our banknotes. It is the proud symbol of the nation's prosperity and good fortune. The cornucopia is a common symbol representing abundance and prosperity. It's a part of our society. 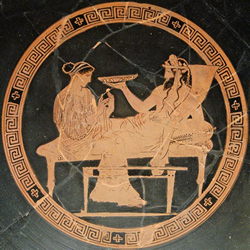 Illustration 14: Persephone and Hades Ploutos (with cornucopia): tondo of an Attic red-figured kylix, ca. 440–430 BCE. Pagan Gods and the Cornucopia: A list of Greek and Roman Gods that either directly use the cornucopia as a defining symbol, are associated with the same concepts (plenty, prosperity, fortune, harvest, etc...) or were directly involved with it's creation as a religious symbol. Greek and Roman Gods; Abundantia, Achelous, Amalthea, Annona, Aequitas, Astarte, Bacchus, Britannia, Bona Dea, Ceres, Concordia, Copia, Decima (Parcae), Demeter, Dionysus, Eirene, Euthemia, Fecunditas, Felicitas, Fortuna, Genius, Hades, Heracles, Hercules, Hilaritas, Hygieia, Jupiter, Lachesis, Laetitia, Liberalitas, Matrones, Moneta, Nemesis, Pax, Pietas, Pluto, Ploutos, Providentia, Pudicitia, Roma, Salus, Spes, Tiberinus, Tyber, Tyche, Zeus. 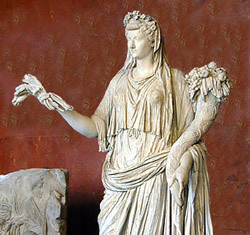 Illustration 15: Livia, wife of Augustus; a life-size statue with attributes of Ceres (floral crown, wheat sheaves, cornucopia). Roman, Tiberian era. "Show Me the tax money." So they brought Him a denarius. And He said to them, "Whose image and inscription is this?" They said to Him, "Caesar's." And He said to them, "Render therefore to Caesar the things that are Caesar's, and to God the things that are God's." "Shall we pay, or shall we not pay?" But He, knowing their hypocrisy, said to them, "Why do you test Me? Bring Me a denarius that I may see it." So they brought it. And He said to them, "Whose image and inscription is this?" They said to Him, "Caesar's." And Jesus answered and said to them, "Render to Caesar the things that are Caesar's, and to God the things that are God's." And they marveled at Him. Illustration 16: RIC 130 Augustus Denarius. Spain, 18-16 BC. Bare head left / Capricorn flying right with cornucopiae on its back and holding a globe attached to a rudder, AVGVSTVS below. "Show Me a denarius. Whose image and inscription does it have?" They answered and said, "Caesar's." And He said to them, "Render therefore to Caesar the things that are Caesar's, and to God the things that are God's." Examples of a Denarius with Caesar's face on one side, and the cornucopia on the other. Though because of the abundance of other types of coins, it's perhaps unlikely that the coin Jesus specifically referred to was one of these. The Cornucopia was probably the most commonly used symbol on Imperial denarii.